Tuffenutterz can provide your company with the setting for a fun and rewarding team building experience. We can cater for medium to large sized businesses, and the experience will enable your employees to participate in obstacle course challenges and create an enjoyable team bonding experience. We cater for primary schools, high schools and universities, and Tuffnutterz is perfect for a fundraising event or school sports day. 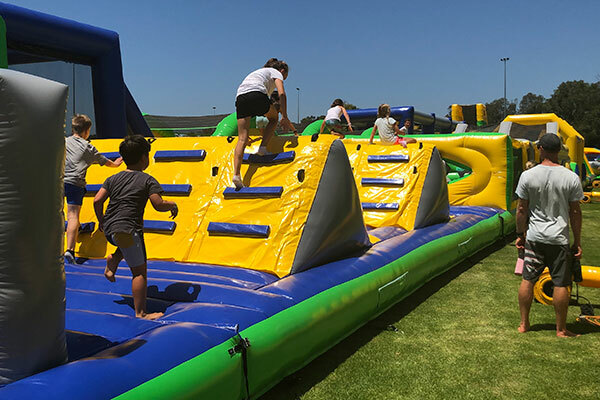 The world’s largest obstacle course can be brought to a suitable local venue near your school. The experience will provide a day of great exercise, team bonding and fun. Tuffnutterz can provide group rates and packages for any occasion. Be it as an inclusion as part of a larger festival, a charity event or a company day out, we will tailor the package to your needs. We can also organise food and beverage stalls to be present on the day.